So ingenious, it’s patented; so different, it’s astonishing. Newly patented Modere I/D is a revolutionary 2-step anti-aging system, clinically tested to intensely hydrate, visibly smooth and balance skin for a noticeably vibrant, undeniably youthful glow. “We are highly focused on creating extraordinary value for our consumers at Modere. We couldn’t be more pleased to have been awarded this patent, because it is further validation that our efforts in offering the best in skincare and nutritional supplements are succeeding,” remarked Asma Ishaq, CEO. 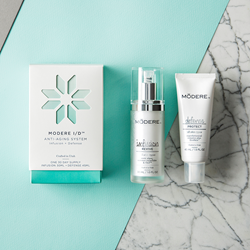 Modere today announced that its revolutionary, two-part anti-aging skincare system, Modere I/D, has been awarded a utility patent. A breakthrough in the science of clean, conscious personal care, Modere I/D’s newly patented Infusion/Defense system uses plant-based active ingredients to reduce the appearance of fine lines and wrinkles and give skin a fresh, vibrant look. Modere I/D’s first step, Infusion, features Ox3™, a proprietary compound that releases oxygen bubbles on contact to waken the skin and make way for two rare botanical extracts, Chlamydomonas Nivalis and Leucojum Aestivum Bulb, to revive and renew the skin. Defense follows Infusion to protect newly revived skin and secure its healthy appearance. Formulated with EcoSkin™ Pre-Probiotic Complex, Defense delivers prebiotics and probiotics to support skin’s natural renewing properties. Dandelion root reduces the effects of skin-damaging airborne pollutants, and Defense’s Superbotanical Complex of 15 plant extracts and concentrates assists in defending and nourishing skin by forming a protective barrier to environmental factors that may accelerate the appearance of fine lines and wrinkles. A wildly popular product, Modere I/D has maintained its position among the company’s top selling skincare products worldwide since its introduction approximately 18 months ago. It has driven sales in North America as the #1 skincare category seller for the past eight months, alternated between the #1 and #2 spots in Europe, and held strong among the top 3 in Australia and Japan for the last year and a half. “We are highly focused on creating extraordinary value for our consumers at Modere. We couldn’t be more pleased to have been awarded this patent, because it is further validation that our efforts in offering the best in skincare and nutritional supplements are succeeding,” remarked Asma Ishaq, CEO of Modere. The U.S. Patent and Trademark Office issued Modere I/D Patent No. 9,925,137 on March 27, 2018. Modere (http://www.modere.com) offers a category-leading portfolio of live clean lifestyle essentials including beauty and personal care, health and wellness, and household products that are equal parts safe, high-performing and scientifically designed. We believe modern health involves pure nutrition, a clean environment and safe ingredients across all our product categories. Modere brings a holistic, live clean approach to well-being, and our products reflect a commitment to excellence and innovation with tested formulas proven around the globe for 30 years. The recipient of multiple third-party validations, our line includes products that are EPA Safer Choice-approved, EWG Verified™, NSF Certified and gray-water safe. The company is a proud supporter of Vitamin Angels®. At Modere, we create more than just products; we create meaningful experiences.